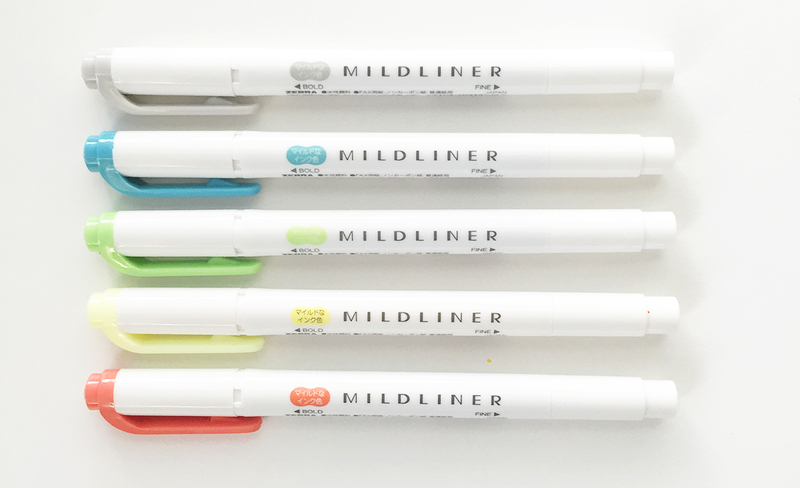 Highlighter Showdown (Mildliner, Frixion, Propus, Beetletip) – studyblurb. Lengthy posts for which Tumblr's design is not intuitive. As promised, here is my highlighters comparison! (My pens comparison will be up in a week.) I’ve reviewed each highlighter’s special features (if any), ink behavior (bleed-through and dry time), color, and pen design. At the end, I did some “superlatives,” ranking the highlighters for different purposes. EDIT: Per request of a reader, I’ve added prices to each of the products from Amazon or JetPens. If the product is available on both sites, I listed the cheaper option. DISCLAIMER: All thoughts expressed here are my personal opinions and what I have concluded through my own personal experience with these highlighters. I have been using them for at least several months (some for several years). I was not paid to write anything. If your opinion/experience is different than mine, feel free to leave a comment below and share your thoughts with others so we can have a more comprehensive view of these products. Firstly, a quick view of all the highlighters I’m reviewing today! The colors you see here may be slightly different than you would see in real life depending on your screen’s color calibration, but I’ve done my best to match the color as close to as they appear in real life. Follow the cut for the in-depth review! I decided to review these first as they are a #studyblr cult favorite. Special Features: Each Mildliner is double-sided, featuring a chisel tip and a fine tip. 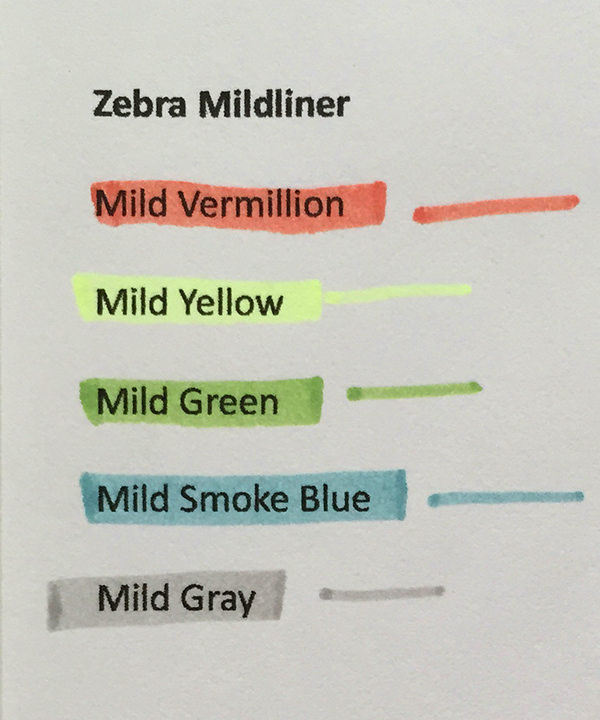 Color: Zebra Mildliners are available in such a unique range of colors, which was why I was initially drawn to them. However, I was incredibly disappointed in these “highlighters”. They’re actually more like markers; the only one that resembles a highlighter was the yellow one (which was very fluorescent), so I would assume the rest of the Mildliner standard/lightest colors available are similarly fluorescent and mild. Ink: These highlighters don’t bleed badly through the paper, but they show up the most on the other side of the page out of all the highlighters I’m presenting today. Since these markers are quite inky, they dry (more like soak into my paper…) quickly. I haven’t tried them on my glossy textbook pages. These were the first set of highlighters I have ever fallen in love, and it is has remained as one of my favorite highlighters for the past few years. Special Features: The tip is the salient feature of this highlighter. I’ve included a diagram that will explain the concept of the beetletip better than I can in words. Color: Colors are fluorescent without being blindingly bright. It is a “soft” fluorescence. The ink dries immediately, even on glossy textbook pages. Design: Although the barrel design leaves much to be desired, the amazing performance of the product way supercedes the lack of aesthetic. Additionally, the width of these highlighters is the thinnest of all the ones presented today. Along with the Kokuyo Beetletips, these are my second favorite set of highlighters. 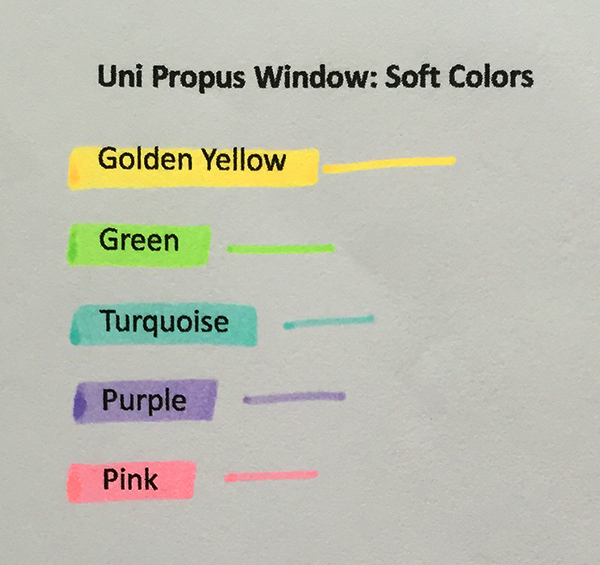 Special Features: The magic of the Uni Propus Window is… its window!! Don’t you hate when you accidentally highlight more than you mean to? This window is to help you see through to where you’re about to highlight and stop when you want to. I’ve included a photo to demonstrate what I mean. Additionally, these highlighters are double-ended: a chisel tip and a fine point. Color: Like the Kokuyo Beetletips, the colors are fluorescent without being blindingly neon. 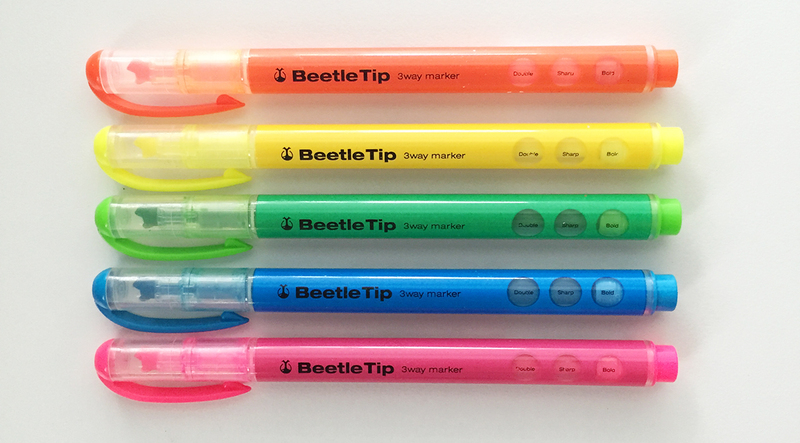 However, these colors are more saturated and a bit darker than the Beetletips. Ink: When used on thin paper, these are more prone to bleeding than the Beetletips, but the bleeding is minimal; it mostly occurs at the “end” of the line, as you can see on the left of the highlight samples (I highlight from right to left). However, when used on thicker paper or on glossy textbook pages, there is no bleed. It does take a bit longer to dry on the page than Beetletips, but not a long time. Design: I think the design is great. Classic and clean, and it’s easy to see which color the highlighter is. The chisel tip is medium-sized – between the Beetletip and the Mildliner. I first tried the US version when I saw them at my school bookstore and thought it was a cool idea. However, I soon forgot about them after being completely enraptured by Kokuyo Beetletips. But after I was gifted the Japanese Pilot Frixions, I absolutely loved them, bringing them all back into my life. These all work great; they are truly erasable. You can’t tell anything was highlighted before! Once you erase an area, you cannot highlight over it again. The unique ink is kind of almost like paint. It sits as a layer over what you are highlighting. Therefore, it leaves a slight chalky cast over what you highlight. It’s pretty unnoticeable, but more apparent when highlighting thick lines such as bolded words. Color: When I want a very pastel or light highlight, the Frixion Light Soft Colors are my go-to! These are actually soft colors. The US versions are slightly more watery, but these were purchased several years before I got the Japan versions, so perhaps the formula has been updated to better match the Japan versions. There is no bleed! Because, as I mentioned, it is more like paint and sits as a layer over the paper rather than the ink soaking into the paper. Dry time is longer than the Beetletip but faster than the Propus Window. Keep in mind that their dry times are all within a second or fraction of a second of each other. 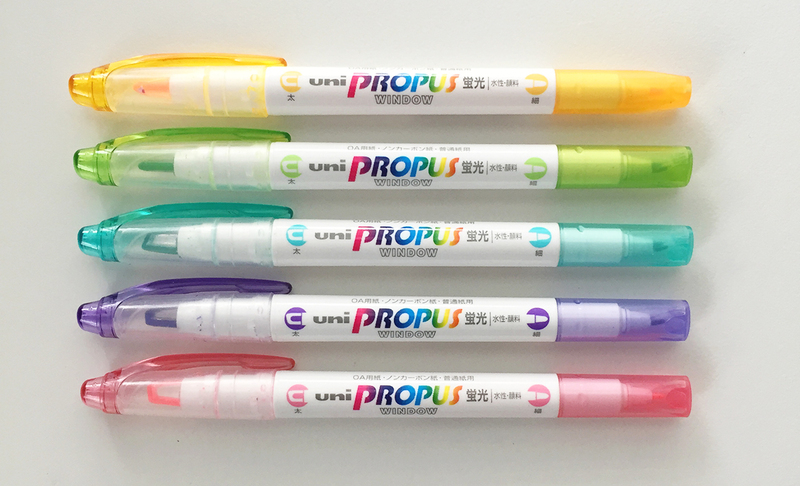 (Surprisingly,) the Frixion highlighters perform the same on glossy textbook pages! They all work about the same; it mostly depends on your your pen ink or pencil lead. 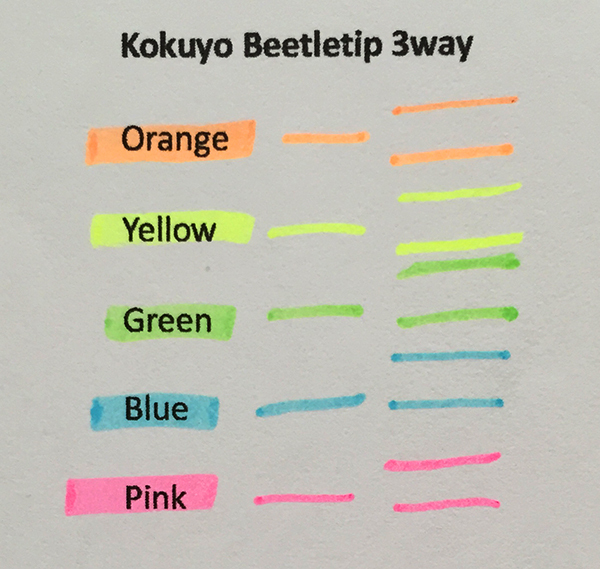 I think the Kokuyo Beetletips fare slightly better than the Uni Propus Windows and the Pilot Frixions. I haven’t tried the Zebra Mildliners. I have not used the Zebra Mildliners on textbooks. Totally and completely disagree about the Zebra Mildliners. I don’t think you weren’t really fair with those. A 1/5? I feel like you used the worst colors. Mine don’t bleed AT ALL (I have all three sets) and the colors look really subtle compared to the other overly bright colors. Preference I guess? But I definitely don’t think you gave them an accurate description at all. Thank you so much for this insightful review! I’ve been debating between the mildliner, propus window, and the pastel frixions for some time now. This was great!